The protected bikeway feels more comfortable than other on-street bikeways — but there are a few chinks in its armor. 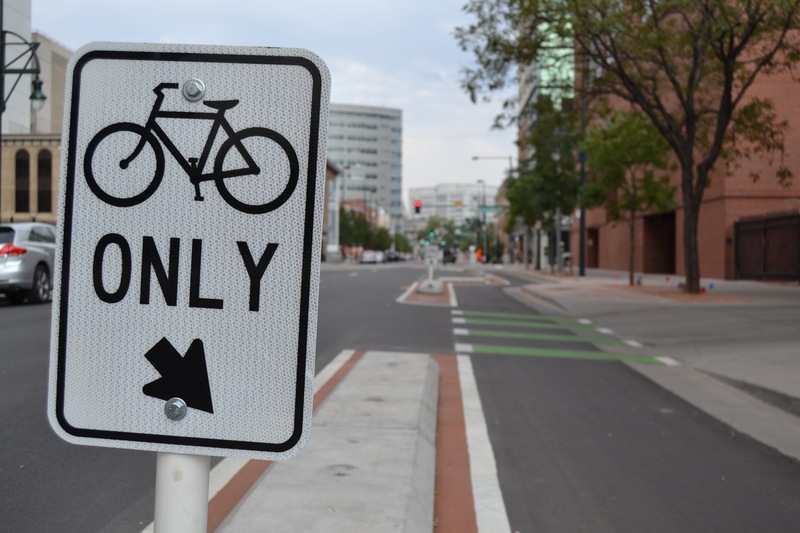 The network of protected bike lanes on downtown Denver’s streets just got a little more connected with the completion of the 14th Street bikeway, which officially opened Friday. 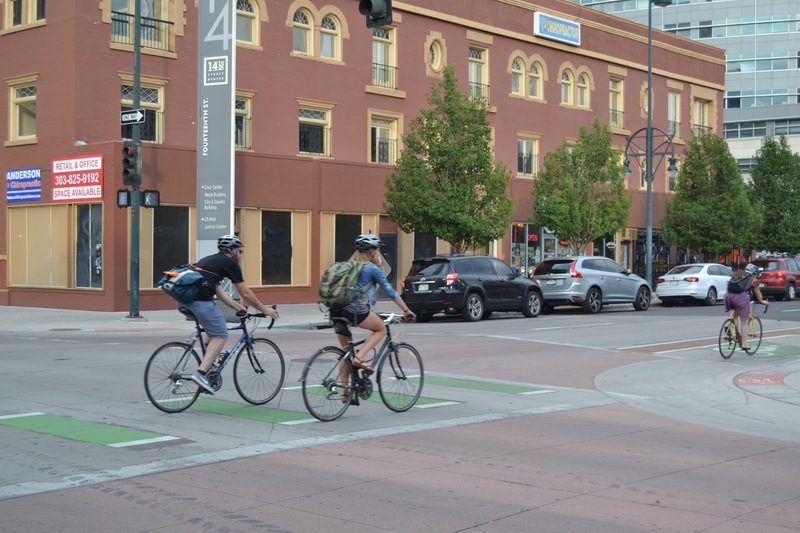 The redesign extends from Market Street south to Colfax Avenue and feels safer than any on-street bikeway in the city. It’s no secret why: Sturdy concrete curbs and parked cars protect people on bikes from vehicle traffic for most of its .8-mile length. Unlike the dilapidated plastic posts on the 15th Street bike lane, this bikeway’s curbs make for a comfortable ride on a popular route. 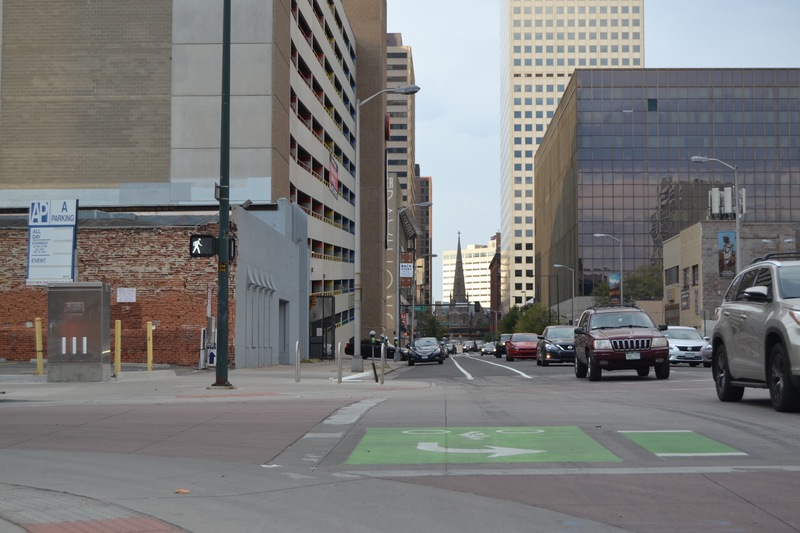 Riders can use 14th Street to connect to two protected bike lanes, five painted bike lanes, four B-Cycle stations, and the Convention Center light rail station. The Cherry Creek Trail is a quick and easy pedal away. 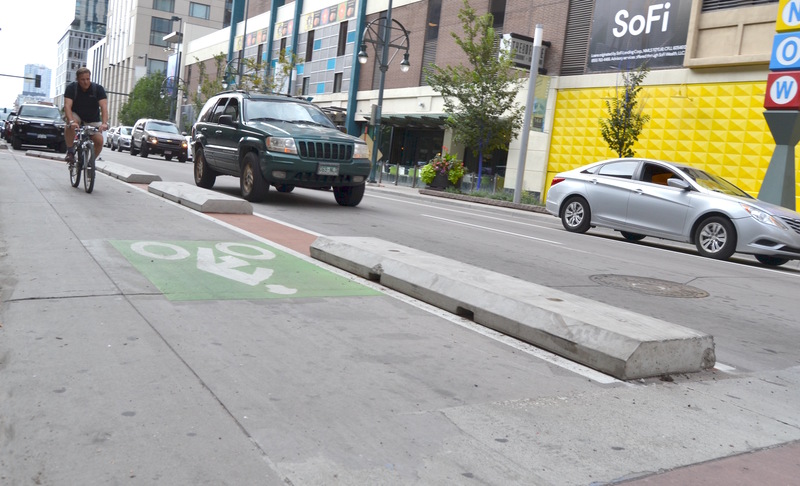 The curbs also stop drivers from squatting in the bike lane — formerly a constant problem on a street lined with busy destinations including the University of Colorado Denver, the Denver Performing Arts Center, the Colorado Convention Center, and several hotels — but only where they exist. 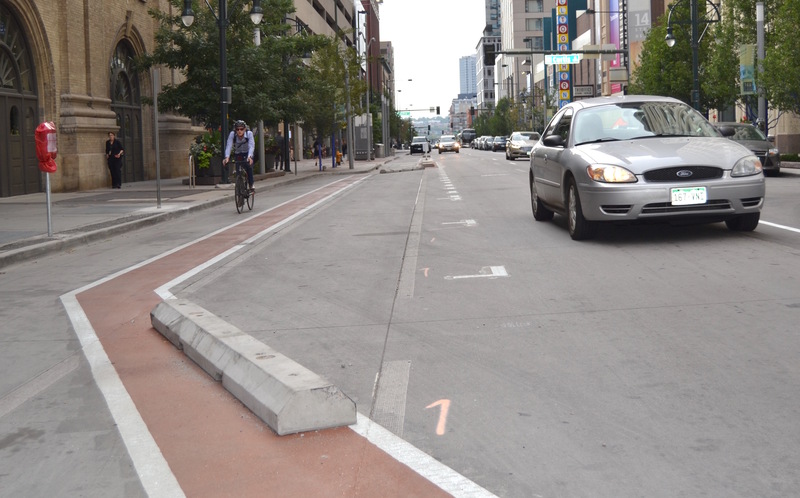 Drivers are sure to abuse the lane on the few segments where curbs don’t physically stop them from entering it. A segment in front of the performing arts center, for instance, lacks the physical barriers. 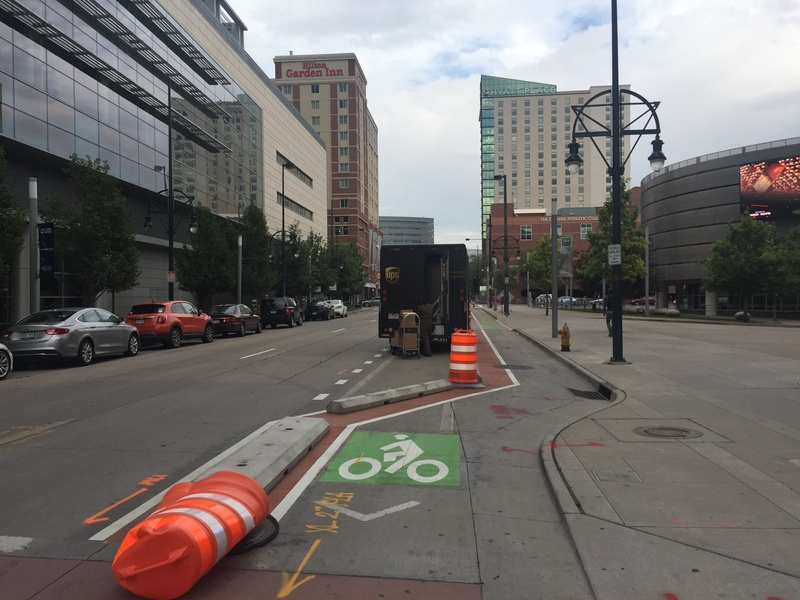 Denver Public Works project manager Brittany Price told Streetsblog that this occurs where there are left turn lanes for cars. Those lanes don’t leave sufficient street width for a curb-protected bike lane that can accommodate plows and street cleaners. At least a lot of signs line the bikeway telling drivers that the space is reserved for people on bikes, which is a nice touch, and one we haven’t seen before to this extent. Unfortunately, the physical protection ends just before Colfax, where the lane becomes buffered from traffic with pavement markings. Even with the drawbacks, the 14th Street bikeway works well. Given its clear advantages over other city bike lanes, this should become the go-to protected bike lane treatment for Mayor Michael Hancock’s street department. Very nice photo-work. I’ve wondered how you find the time… but credit where it’s due. You know, snow plows don’t ride on fixed-guidance rails. If the lane is too narrow they’re totally capable of skootching to the left. Once again the safety of cyclists is sacrificed to the convenience of drivers. I read that sentence as saying that plows and sweepers couldn’t fit in the bike lane at its current width if it had a curb. Which of course means we should plan for wider bike lanes so that they can be both protected and properly maintained. This is on my daily route to work and I’ve been loving the upgrade. It just feels safe making biking to work more relaxing and less stressful. I’ve also noticed far more people biking already. It’s certainly a welcome improvement. Now if only the Lawrence St bike lane could be improved. “The redesign extends from Market Street north to Colfax Avenue” ?? ?